Welcome to Bubble Company. We build all types of eye catching inflatables to promote your products, business, logo, brand or trademark. 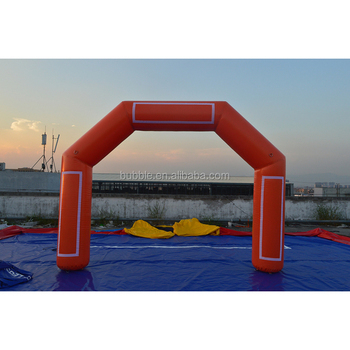 Inflatable arch is inflatable structure that is inflated by an external cold air inflation fan connected to the arch via a tube (also can be made into airtight style without inflation all the time). Inflatable arches are usually 3m to 15m long, usually used as entrances to events or as ad space and mile markers for races. Multiple design capability make the arch a very versatile component for multiple event and promotional initiatives. Some of the more popular designs include the tube arch and the block arch both of which can be further customized with 3 dimensional protrusions, digital printing and temporary banners. Inflatable Arches can be used for sport games, events, decorations, and business advertising like promotions, grand opening, trade shows, etc. We have many colors and shapes for your options. Q: What are Inflatable Arches made of? A: durable PVC tarpaulin or PVC vinyl, abrasion resistant, lead free, weather-resistant, waterproof, fire-retartant, UV protective, 0.25mm to 1.0mm thickness. Q: Why PVC vinyl more expensive than PVC tarpaulin? 3). more heavy duty and better wind resistance. Q: How to inflate an Inflatable Arch? A: Can inflate with air by an electric air blower included. It usually takes 1 to 2 minutes to inflate an arch depending on design. Q: Can we use Inflatable Arch in winds? A: Yes, we make D rings and match ropes for you to tie for stability. You can also use sand bags or water bags to increase stability. However, please consider the arch as a balloon and use it depending on actual scene. Q: Can we use Inflatable Arch in rain? A: Yes but since the blower is connected with electricity, we don't suggest use under heavy rain although the arch material and blower plastic case are waterproof. Q: Can make with our logo printings? A: Yes. This is extra charged depending on quantity, printing colour and size. You may send us high resolution artwork in JPG, PDF or PSD. Q: What happens if the Arch punctures? A: Due to constant blown air, the arch can still be blown up and use as long as the damage area is not big.The damage can be repaired by sewing machine, and PVC vinyl arches can also simply be repaired by our repair kit (material patches and glue). Q: Can you send me design sketch to confirm before production? A: Yes. After you place an order, we can use your custom requirements to make a design sketch, and will start production after your confirmation. 1. Custom Designs available for different shape, size, colour, logo printing, etc. 2. Material: durable PVC tarpaulin or PVC vinyl, abrasion resistant, lead free, weather-resistant, waterproof, fire-retartant, UV protective, 0.25mm to 1.0mm thickness. 3. Professional Machines for Cutting, Sewing, Welding and Printing to ensure high quality. 5. All these designs are made in constant air blown style with blower working all the time. Most designs can upgrade to Deluxe airtight (sealed) style. 6. Price includes air blower (CE 220v-240v or UL 110v-120v with various kinds of plugs) and anchoring ropes. 7. Optional accessories: halogen/LED lamp, banners, etc. 9. Packing: Strong packing bag and export carton for transport and reuse. 11. Payment: 30% deposit, by T/T (telegraphic transfer), L/C, Western Union, Money Gram, Pay.Pal, etc.